So, what’s the difference between AWD and 4WD? Well, in absolute simple terms both systems – all-wheel drive (AWD) and four-wheel drive (4WD) – drive all four wheels, hence their names, but from there things swiftly become increasingly complicated. In the real world, things are never that simple but generally AWD vehicles are lighter and lower (think Subaru Forester et al) than 4WDs and more suited to fast road and dirt-track driving than slow off-road driving because they lack the ground clearance and the drivetrain built to cop sustained off-road work. Vehicles with permanently engaged AWD systems have been designed and engineered for daily driving on the blacktop “with occasional dirt or mild off road use”, Subaru states. The difference between all-wheel drive and four-wheel drive systems lays beyond the seeming similarities of the two and is deeper within the fine-print machinations of the systems themselves and the real-world applications they were engineered for. But which is the better unit in an AWD vs 4WD face-off? Which is the better of the two on-road, off-road and which is best for your family? Read on and find out. In most traditional, off-road-focused 4WDs the drive from the engine is sent to the rear wheels by default through the transfer case. The transfer case houses two cogs, which can be connected by a chain. You disengage the chain for two-wheel drive - just the rears - and it's operational in 4WD; this locks the speed of the front axle to the speed of the rear one. Four-wheel drives run in 2WD on the road, a high-grip surface, because you don't need all four for optimum traction the way you would on gravel back roads or tracks. In part-time 4WD systems – sometimes referred to as on-demand 4x4 or 4WD systems – engaging the transfer case gives you maximum drive in slow-going off-road scenarios. The wheels will still slip and scrabble due to the loose surface, though, which ensures that any overwinding on a wheel will resolve itself by spinning to release the tension. On the road, however, wheels need to spin independently to drive around corners. If each wheel's rotation is constricted by the 4WD system, cornering will cause tyres to slip or spin to try and maintain a constant rotation rate. If you did use 4WD on the road for extended periods you’re asking for strife: it will increase fuel consumption, inflict unnecessary wear and tear on your vehicle and, worse still, cause serious damage to it, due to transmission wind-up (aka driveline binding). That's a situation in which your off-roader’s drivetrain cops massive amounts of stress due to the extreme torque forces involved in forcing your vehicle, locked in 4WD, to take on bends and turn corners when all four wheels are still turning at that constant rotation rate. If the tyres can't slip to relieve the pent-up energy, that ‘winding up’ stresses the wheel hubs and driveline to breaking point, which can be, in the least, very expensive to fix and, at its worst, very dangerous. Full-time 4WD powers all four wheels, all the time. To get around that problem of transmission wind-up, mentioned above, the system employs a centre differential (or simply diff), which allows a different speed for each axle. Even though the transfer case is constantly engaged to power the front and rear wheels, the diff allows for different rotation speeds. This means that, on the road, the four-wheel drive system won't try to hold each wheel at a fixed speed, avoiding the potential for transmission wind-up. In full-time systems the diff can be locked, forcing the wheels to rotate at the same rate, and thus providing the same gravel-grappling off-road ability as its part-time counterparts. The Toyota LandCruiser 70 Series is an example of a vehicle with low-range 4WD. Part-time and full-time 4WDs will generally have a dual-range transfer case and this gives you even more freedom when it comes to just how far you can go off the beaten track. First, high range: In 2H (two-wheel drive, high range) two wheels, usually the rear, are driving your vehicle. You use 2H for normal road driving. In 4H (four-wheel drive, high range) all four wheels are driving your vehicle. You use 4H for surfaces which you may need greater traction than you would for bitumen; think firm sand, dirt roads, gravel tracks and the like. Next, low range: In 4L (four-wheel drive, low range), all four wheels are driving your vehicle and a low gear ratio is being used. Your vehicle’s wheels will turn much more slowly than they would in high-range, so slower speeds and much more torque are the go. You use 4L for soft sand, sand dunes, steep hills and declines, deep mud or snow, and slow-going rock-crawling. It used to be that you would have to engage high- or low-range using a little shifter (the stubby stick) near your main manual or auto shifter, and some of us from The Old Days even had to get out of our 4WDs and actually lock our manual locking hubs on the front wheels for off-road work; and then unlock them when switching back to 2H. 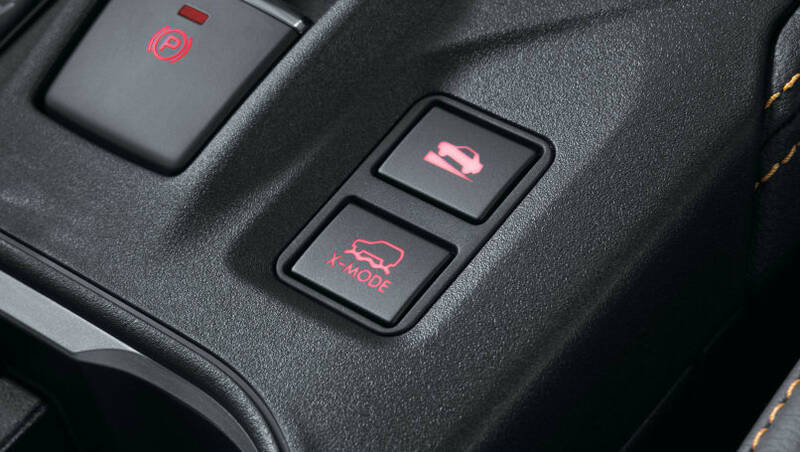 Not any more; you can now switch to high- or low-range via a dial or knob in the cabin. In many modern 4WDs you can switch from 2H to 4H without stopping, but still have to come to a complete stop to switch from 4H to 4L. Subaru's permanent AWD is capable of sending up to 70 per cent of torque to the rear axle. All-wheel drive cars don’t use a transfer case; they use a drive system with a mechanism – a limited slip differential or an electronically-controlled clutch – that directs torque to where it's needed most in a bid to achieve optimum traction, while still allowing for a rotational difference between front and rear axles. 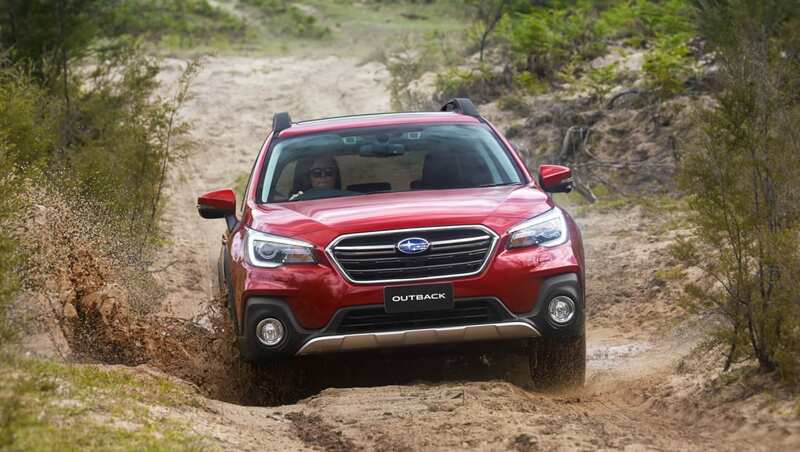 "In a lot of all-wheel-drive systems, the engine drives a front-mounted gearbox, which drives the front axle through the front differential first," Subaru Australia's tech guru Ben Grover explains. "The rotation of the front axle in turn runs a central shaft, which turns the rear axle. "This means that the majority of the torque goes to the front axle, with the rear driveshaft receiving a maximum of 40 per cent. A permanently engaged AWD system will yield more traction than a driver-selectable 4WD system in an “unexpected situation where the corner is more slippery than expected or when immediate traction is required to move safely into merging traffic”, Subaru reckons. Remember: all-wheel drive cars are designed for use on bitumen roads with some dirt or light-duty off-road use. 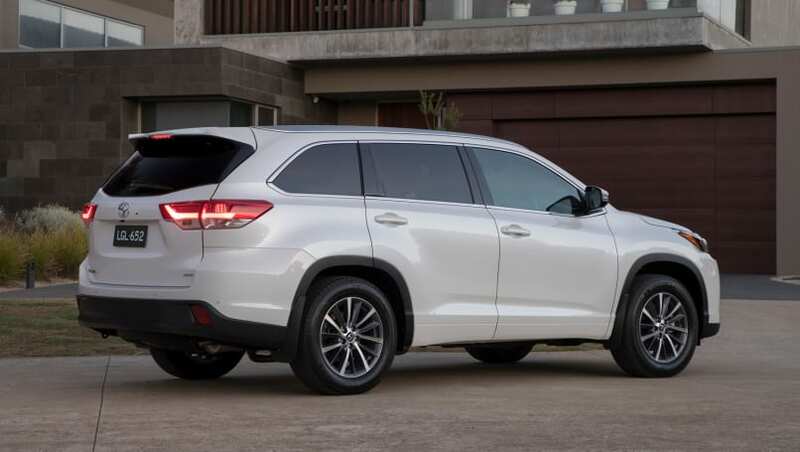 The Toyota Kluger is available with on-demand AWD in higher spec models. This is commonly used on passenger cars and the more city-friendly SUVs. Instead of constantly powering all wheels, the vehicle runs in two-wheel drive (generally the front wheels) by default. When the fronts begin to spin, sensors detect a loss of traction and redirect engine torque to the other axle to ensure maximum grip. It's a clever system, because it doesn't give you what you don't need, until you actually do. The reduced friction of only driving two wheels most of the time also tends to use less fuel than full-time all-wheel drive systems, which can represent big savings over the life of a vehicle. So, is an SUV AWD or 4WD? SUV (sports utility vehicle) is an acronym that originated in the US and was used to describe an off-roader, generally a 4WD vehicle, built on a light-truck chassis. In recent years, SUV has increasingly been used in Australia in market and marketing terms as an all-encompassing title for any car-like vehicle – including even ‘soft’ city-focussed crossovers – with even the vaguest of connections to ever being used in the outdoors. ‘SUV’ has nothing to do with a vehicle’s drive type or off-road capabilities. So, can you take AWD off-road? Sure, you can – but we’d recommend you don’t go too far in one. Lighter and lower than 4WDs, AWD vehicles are well suited to driving along gravel tracks, formed trails and tackling light-duty off-roading, for example, firm beach sand, that sort of thing. As mentioned, AWDs generally have less ground clearance than their 4WD rivals, and so they are more susceptible to getting ‘hung up’ on obstacles (rocks, tree stumps) or caught out on terrain (deep sand). You’re also not afforded as much clearance when it comes to driving in deep wheel tracks or ruts, so the underbody is vulnerable to damage. An AWD drivetrain is not engineered to cope with the rigors of tough off-roading, such as long periods of soft-sand driving. A four-wheel drive is generally bigger, heavier, more robust and has a drivetrain and chassis built to withstand the worst off-roading you can throw at them, so they are very well suited to slow-going driving over rugged terrain. Which is better, AWD or 4WD? That depends what you’re going to use it for. Ask yourself: Which is best for me – AWD or 4WD? If you and your family love the outdoors and camping but to get there you don’t have to stray beyond well-maintained gravel tracks or formed trails in Australia’s many national parks, then an AWD offers plenty of comfort, safety, and versatility for urban, suburban and country driving. Though the gap is narrowing rapidly between 4WD and AWD vehicles, in terms of car-like ride and handling, AWDs still generally pip 4WDs in the all-round comfort stakes. But an all-wheel drive’s lower ground clearance and air intake, as well as its drivetrain and chassis, which are not as well-suited to off-road stresses as those in a 4WD, mean AWD vehicles aren't anywhere near as universally bush-and-beach capable as a purpose-built 4WD. 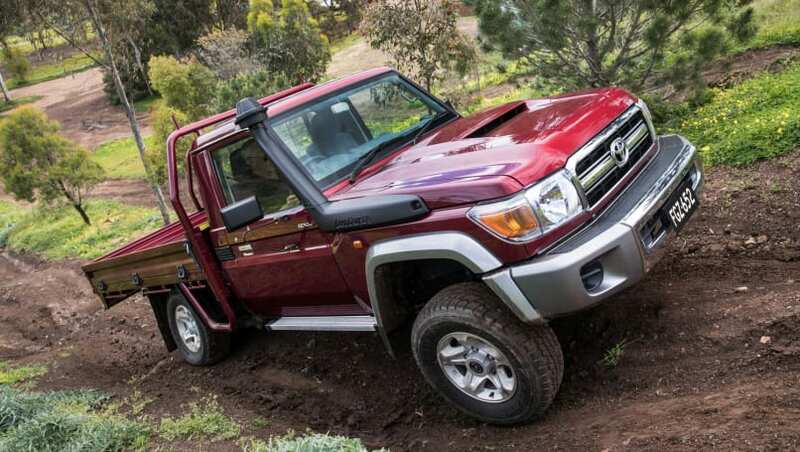 If you have a large family and you love camping in out-of-the-way places that are difficult to reach in anything other than a LandCruiser, then you’ll need a 4WD. These vehicles have the drivetrain, gearing, suspension, ground clearance, air intake height, not to mention approach, departure and ramp-over angles to better traverse off-road terrain than an AWD. There is also plenty of aftermarket equipment available for 4WDs – suspension upgrades, snorkels and more – to further boost their off-road capabilities. Editor's Note: This post was originally published in June 2015 and has now been updated for accuracy and comprehensiveness.